Rita Vrataski: You're a good man, Cage. I wish I had the chance to know you better. 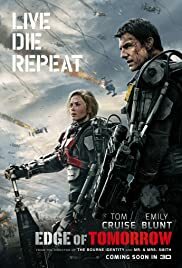 Q: Is "Edge of Tomorrow" based on a book? Q: What song is playing when the movie ends? After watching the trailer i was really hyped about the movie because of its theme and potential to be a really good movie. But on the other side i knew how bad the most potential good movies in the past ended up. I was scared that they screw it up and give us another Oblivion or Ilisium with much cgi-effects and bad story and no real story and/or characters. So i took my girlfriend and went in the movie with mixed feelings. But then, right from the beginning, i knew this movie would be fantastic. The first minutes really hooked me and i found myself in a funny, filled with perfect action and intelligent movie. You had the feeling like you were directly in it and you really feel with Tom Cruise from the beginning to the end. 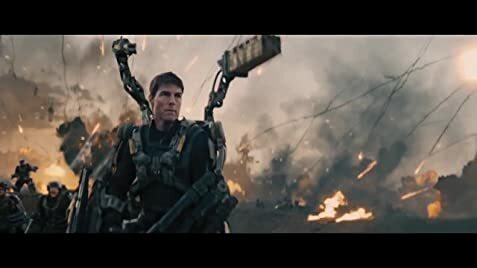 I don't like Tom Cruise in general but this role just fits him. Nobody who sees this movie could deny this. From minute to minute i was more and more in this fantastic story and wanted to last forever. But eventually the movie ended and i was really satisfied with everything. Two main characters who played perfectly, a fascinating story well told and really fast and good looking action made it for me the best movie i watched in a while (and i watch pretty much movies). Even though i don't like to recommend movies because of different tastes I really want to do this with this movie. The story is well told and there are no boring repeatings. Even my girlfriend who normally don't like movies with much action liked it a lot and added Emily Blunt to one of her favorite actresses of all time. 540 of 671 people found this review helpful. Was this review helpful to you?